One of my favorite things to do in February is to snuggle up in a warm blanket with my back to the sun on a cloudless cold day and read a book or write in my spirals. I’ll move my chair around to make sure I absorb as much warmth as possible as the sun arches across my back porch. All is cozy until the infamous Northers blow and I am startled out of my revery and clamor to seek some kind of barrier from the sudden bitting wind. The same is true of a garden. 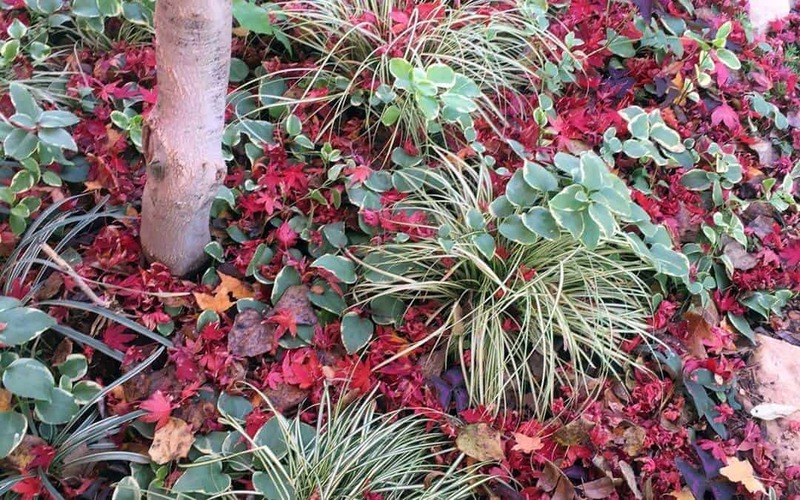 A warm blanket of mulch is needed to protect root systems from the occasional Texas hard freeze. With the frigid northers, comes torrents of rain and hail, so mulch also protects from soil erosion. A covering of mulch incubates the seeds that have dropped from matured plant seed heads that drop their seeds waiting for the next season to sprout again. In addition, as it decomposes, natural organic mulch adds extra nutrients to depleted tired dirt. Recently, I swept the vibrantly colored Japanese Maple leaves off of my back porch and added them to their existing brothers and sisters that had already fallen from their branches amongst the decorative variegated grasses! As evidenced in this picture, natural homegrown mulch is not only cheap but quite strikingly beautiful as well. Have you cozied up to your garden yet? I think you are the only person I know who can make mulch poetic! Hah! There are plenty of us weirdos out there who want a pile of dirt or compost for valentine’s instead of chocolates, although I’d never refuse a box of chocolates! Up in New York on Long Island, I have to mulch in the fall, or the leaves are long gone by Spring. I do enjoy using my fallen leaves, but often augment with regular store bought mulch because of the impending snow blanket. I let the sea grasses do their thing all winter, and they quite often shed ½ their stalks by spring. I’m sure that mulching with real snow in the forecast is a whole other challenge, but the principle is the same, as you’ve shared so well. I’ve heard that snow acts as insulation as well when it falls on the already mulched ground. In TX, we mulch twice a year to protect from hard freezes and torrential rains, as well as protection from 100+ temperatures and drought in the summer. I’m sure those seagrasses are extraordinary in the summer, undulating in the sea breezes! I love hearing about gardening stories from other regions.